Oh no! A cliff-hanger ending just before the weekend! What will happen to our heroes? Whoa! You are really working the legos! I love the action in this one :). I also don't think I'll be able to sleep knowing that Freddy's fallen behind the sky! I'm beginning to wonder about you Nate. If for no other reason, I curse the weekend for forcing me to endure this cliffhanger. Nice work, Nate. I hate when the sky comes unpegged. I really need to get me one of those fairy poles. I think they would be dandy to keep inattentive students in line. This is perhaps even more awesome than your webcomics. Also, the amount of time you spend playing with LEGOs is perhaps worrisome for a man your age. Jessica...you have no idea. I want a fairy pole, too, DaNae. You can't really see it, but the Vikings are tearing up the cover building--I didn't have room to show everything. You can kind of see the loose pieces on the ground. Anyway, I'm glad everyone is enjoying the LEGO series so far--there's only one more strip in the series, it'll be up Monday morning. Thanks for the spectacular comments everyone! You guys are hysterical! Pru seems remarkably complacent about being waved around like that. Or maybe her LEGO version is just less audible than the illustrated Prudence. Pru's probably a viking mole. They have good hats. Oh my goodness! 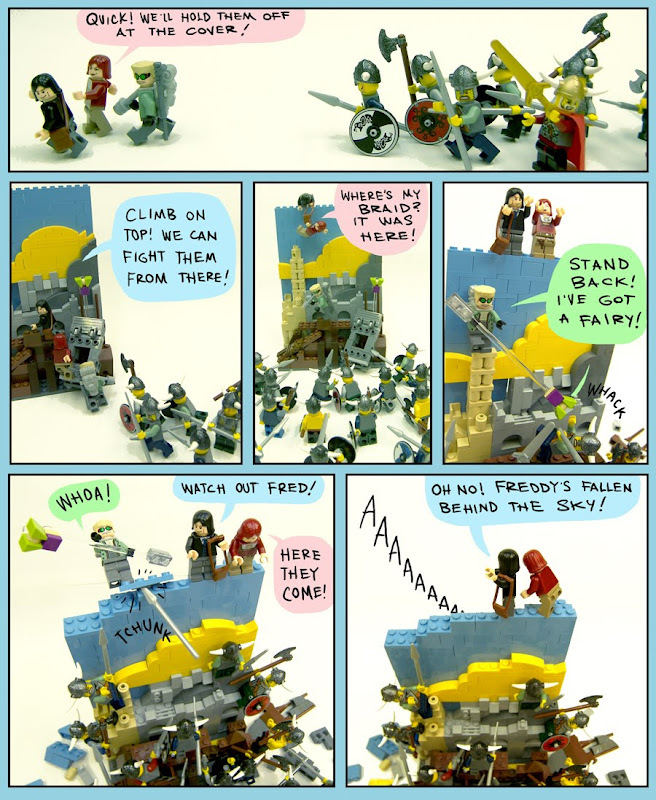 I can't wait to show this to my Lego-obsessed, comic-loving 9-year-old son, who will be receiving Calamity Jack for his half birthday this Friday!